The two photos above suggest the complexity of Hindu tradition — on one side earthly and historical, and on the other psychological and mythological. 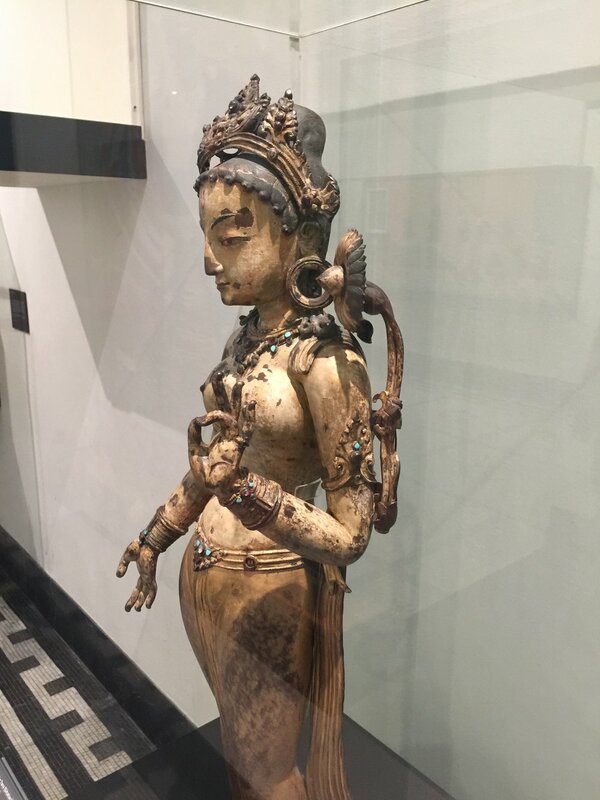 The female earth-spirit or yakshi on the left goes back to the Mother Goddess of pre-Hindu Harappan culture and is linked to attaining desires and fecundity. 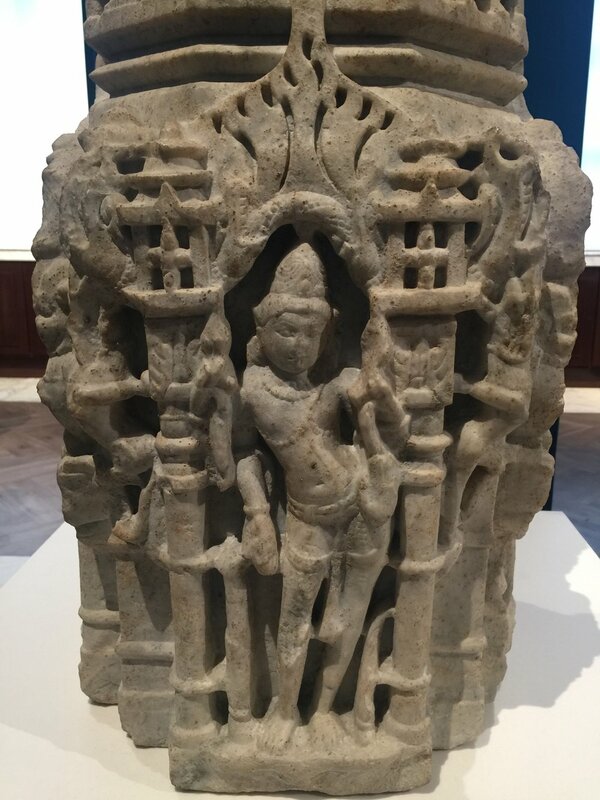 A page at the Art Institute of Chicago describes a yakshi as “a female earth spirit, accepted as a symbol of fertility by the Hindu, Buddhist, and Jain faiths. She is usually portrayed as a wide-hipped, voluptuous woman, who can cause a tree to bear fruit simply by touching it with her foot.” To the right is Vahari, the female energy of the third incarnation of Vishnu. 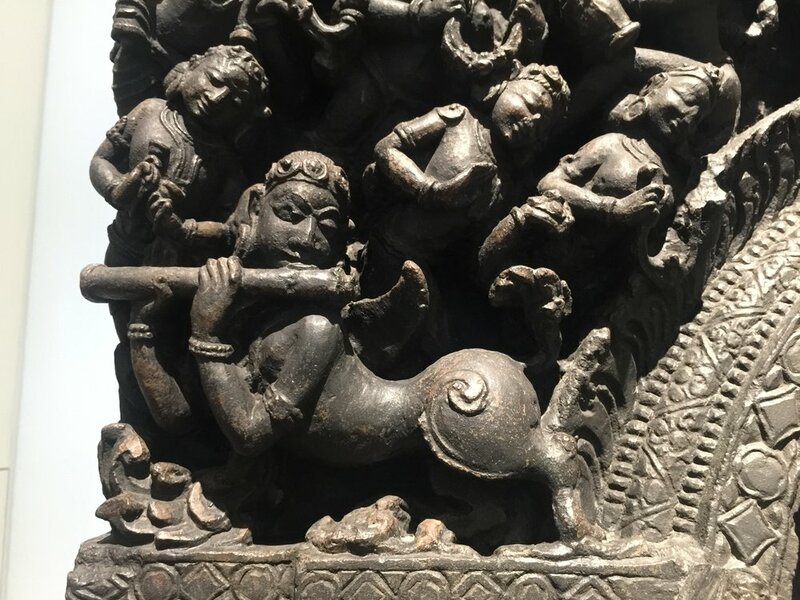 Vahari thus suggests conceptual and hierarchical aspects of Hindu theology, such as female energy (alone and/or as a complement to male matter), gods (here Vishnu), and the incarnation of gods (here Vishnu as a boar). White Tara with lotus over shoulder and giving a blessing, Nepal, 1300-1400. In Buddhism, Tara is associated with liberation, compassion, and success. From the Victoria & Albert Museum. Guruda — the half-human, half-eagle mount of Vishnu — in combat with snake-like water-spirits (nagas), Nepal, 1550-1600. From the Victoria & Albert Museum. Nandi, the mount of Shiva. South-west India, 1500s. I love this statue — he’s so massive yet somehow tender & wise. Our old friend Garuda — ready to take flight!